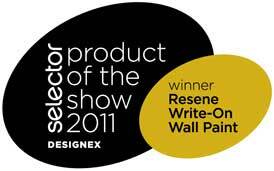 Unlike normal whiteboards, Resene Write-on Wall Paint is designed to work with your existing décor by allowing the colour of your walls to show through the clear finish. 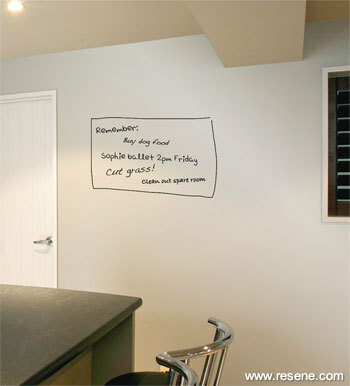 So you can have a Resene Tea coloured whiteboard, a Resene Spanish White one or any other light Resene colour that you desire by simply changing the colour of the wall prior to applying clear Resene Write-on Wall Paint. Use it in your kitchen to write your reminders, in your office for your to do list, in your conference room to share ideas and in schools for brainstorming, art and more. 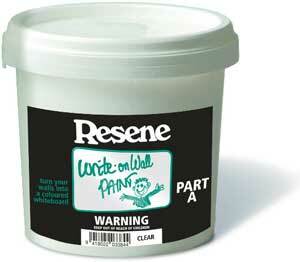 With Resene Write-on Wall Paint there’s no limit to your ideas. Available from Resene ColorShops and resellers. See Data Sheet D907 for more technical information.